It’s officially Panic time, I mean BreyerFest time! I’m checking my BreyerFest Pickup List to see who has been naughty and who has been nice. I have all the orders that were placed through the website neatly on record. Thank you to those of you that used the website, it made those orders so easy! I pieced together the orders that were placed via Facebook and by email. If you didn’t place your pickup order through the website, could you pretty please shoot me an email so that I can make sure I have you on the list (the nice list)? Please email me at aidanstoytrove@gmail.com with your name and the name of the horses that are being picked up. If we are picking up a Breyer Man O’ War from the Kentucky Horse Park too please make note of this as well. We want to make doubly sure that none of you fall through the cracks! We owe at least one ticket reimbursement and will be knocking that off as I go through the checklist. Some of you still owe balances. We are being lenient on this and will allow the balance to be paid along with shipping when the horses are ready to ship. We are looking to trade a handful of BreyerFest Tent Tickets for different times so if you have a ticket you are looking to trade, please shoot us a message at aidanstoytrove@gmail.com. We will be available to trade tickets in person on Thursday at the Clarion. While me may be able to ship some BreyerFest orders directly from Kentucky, the vast majority, if not all the orders will be shipped when we return home from California. You can expect your order to ship the week of July 23rd. We will be sending out Paypal invoices individually to those that still have balances due as well as for the cost of shipping when your order is ready to ship. You will receive a USPS Tracking number when your order ships. Those of you that ordered through the website have already paid shipping and do not owe any additional money. 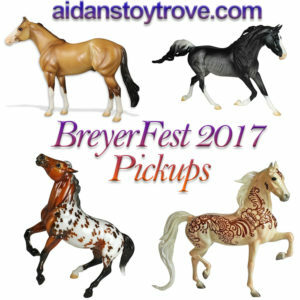 Most importantly, thank you to all that have chosen Aidan’s Toy Trove to do your BreyerFest Pickup for you. We are eager to see all of the BreyerFest models in person and we can’t wait to send these fabulous BreyerFest 2017 Horses on to their new homes. Thank you everyone!